Bug Repellent…another thing with way too many scary chemicals in it! And I don’t know about you, but I think the reason the bugs stay away isn’t because of what’s in the repellent, it’s because of how smelly it is! Here are some essential oil buy spray recipes to try that won’t leave your nose burning! I found the little spray bottle pictured above at Target for less than $1 in the travel section. You could also re-use an empty spray bottle from something you have at home! Since these recipes contain citrus oils this spray is best used on your clothing or around the area you are in instead of on your skin. Do you make homemade bug spray? What’s your recipe? I’ve been waiting on you to share your homemade repellent! Where do you buy your essential oils? And also, thank you for such a wonderful, down-to-earth site! Just a cautionary note.. When you use essential oils, expect their active properties to be working on you as well when you spray them on you. There is a lot more to them than just their scents. You wouldnt want to use any of these on a child especially at night.. or you either to be honest. Lemon, mints, & citronella are stimulating & energizing so keep that in mind. I would just test it out & see how it affects you & yours. I never thought about making my own. Thanks for sharing! Smell good AND don’t get bit up. Such a great idea. Thanks for sharing. Great tip. I have pine and sage essential oils from soap making. Would they work just as well as bug repellent? Great post just in time for summer! Thanks for linking up at Tiny Tip Tuesday! Wow that is pretty easy! I have peppermint oil…that won’t work without the lemon added? thanks for re-posting the week’s summary… I guess I must have missed this one. I don’t use bug repellent because of all of the chemicals. This looks like a great alternative! Not a homemade recipe, but nonetheless something me, my wife, and 7 kids have used for 3 years with great effectiveness against all the deer ticks, lonestar’s, mosquitos, and other bugs we have out here in Southern Indiana. It’s called BioUD. An application will last for about 4 hours. It is a synthesized version of a natural oil produced by a wild tomato plant. Hey! Yes, I make my own bug spray too! 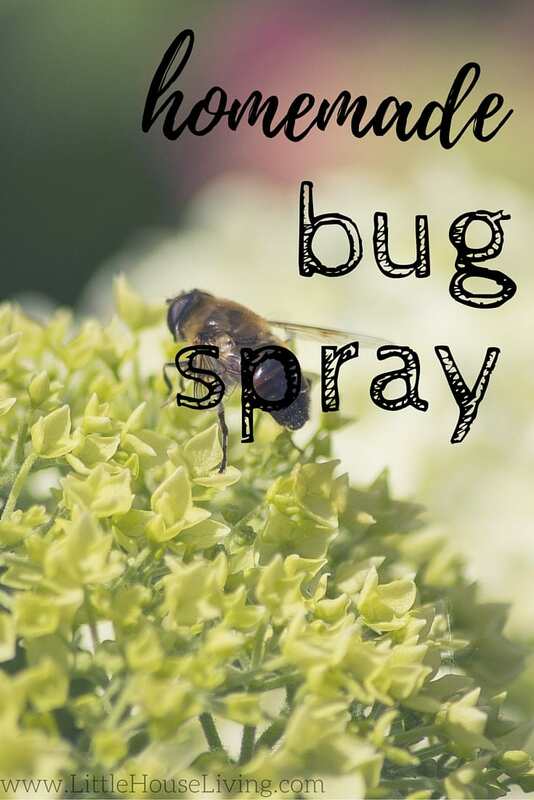 Here is a link to my post on bug spray and recipes to use. 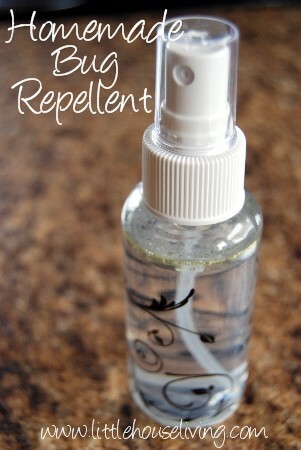 I took my homemade spray with me to Honduras, on a missions trip, and I never had one bug bite OR get near me! It was wonderful! Awesome! I have a blog devoted to living more self-sufficiently (www.modernpioneergirl.blogspot.com) and a lot of readers have been messaging me to ask about homemade bug repellents. Would it be okay if I share this recipe with them? Also, that seems like a lot of essential oils. Have you (or anyone) played around with the numbers to see if less works? Or does it just need to be that much to be effective? Great recipes. I’ll have to play with them. 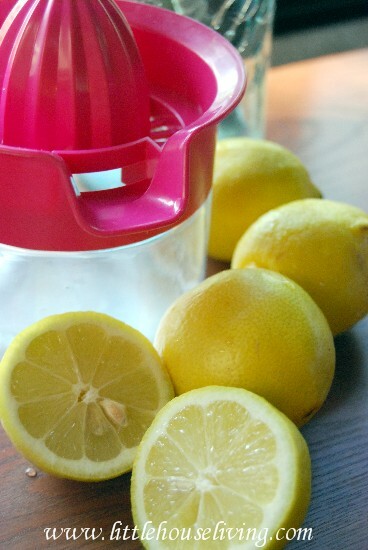 I make my own, too, that has a lemon base, because I heard mosquitoes do not like acidic skin. But I never considered lemon essential oil. That will be an interesting twist. Bug Button is a non-toxic insect repellent that can be pinned on almost any type of clothing (hats, shirts, vests, etc). Citrus oils are phototoxic, meaning when the sun hits them on your skin, it will burn. Imo, you’d be better off using the peppermint or citronella. I agree. Citrus oils are probably not a good idea. I am going to try a mixture of peppermint and lavender next summer. I’ve heard vanilla helps, but it sure didn’t work for me. I think it even attracted more! Just a note: citrus essential oils cause photosensitivity, so while lemon or lemongrass EO’s may be great at repelling mosquitoes, if applied to the skin, you may become more easily sunburned. That’s why I would recommend this recipe to be sprayed only on clothing. I have also found that Catnip oil works great too, plus it makes your cats love you that much more! I made the peppermint one yesterday only with lemongrass since I was out of lemon, used it this morning when I took the dogs out.. not one bite worked great!